Brian Hoskins of NIST and the University of California, Santa Barbara, along with NIST scientists Nikolai Zhitenev, Andrei Kolmakov, Jabez McClelland and their colleagues from the University of Maryland's NanoCenter in College Park and the Institute for Research and Development in Microtechnologies in Bucharest, reported the findings in a recent Nature Communications. 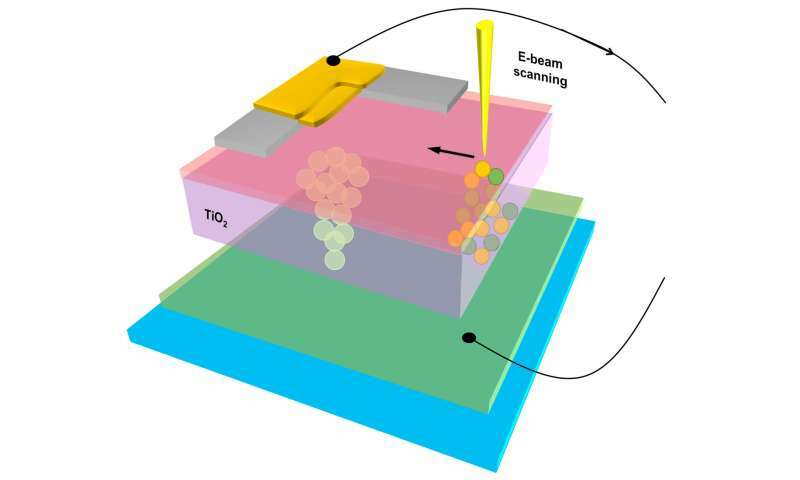 To explore the electrical function of memristors, the team aimed a tightly focused beam of electrons at different locations on a titanium dioxide memristor. The beam knocked free some of the device's electrons, which formed ultrasharp images of those locations. The beam also induced four distinct currents to flow within the device. The team determined that the currents are associated with the multiple interfaces between materials in the memristor, which consists of two metal (conducting) layers separated by an insulator. "We know exactly where each of the currents are coming from because we are controlling the location of the beam that is inducing those currents," said Hoskins. In imaging the device, the team found several dark spots—regions of enhanced conductivity—which indicated places where current might leak out of the memristor during its normal operation. These leakage pathways resided outside the memristor's core—where it switches between the low and high resistance levels that are useful in an electronic device. The finding suggests that reducing the size of a memristor could minimize or even eliminate some of the unwanted current pathways. Although researchers had suspected that might be the case, they had lacked experimental guidance about just how much to reduce the size of the device. Because the leakage pathways are tiny, involving distances of only 100 to 300 nanometers, "you're probably not going to start seeing some really big improvements until you reduce dimensions of the memristor on that scale," Hoskins said. To their surprise, the team also found that the current that correlated with the memristor's switch in resistance didn't come from the active switching material at all, but the metal layer above it. The most important lesson of the memristor study, Hoskins noted, "is that you can't just worry about the resistive switch, the switching spot itself, you have to worry about everything around it." The team's study, he added, "is a way of generating much stronger intuition about what might be a good way to engineer memristors." Now, this confuses me. Those advocating for the construction of Artificial Intelligence, with the claim that AI's will solve all our problems? As Benevolent Computer Overlords of us puny, incompetent humans? Why, please to explain. Why do you insist on copying the same biological processes that result in Modern Homer Sap? Cause I thought that was the who;e point of electro-mechanical devices. To make up for all our shortcomings, ignorance and weakness of character. I dunnow Mack. Looks to me that all humans want to learn is how to repeat the mistakes of history, And when ever possible, make a bad situation even worse!